Valve's Steam Reviews program is in open beta, letting players rate games alongside the traditional Metacritic ranking. Over the past ten years, Valve has slowly been turning Steam into a one-stop digital gaming service. Not only does it provide access to a massive library of titles, it encompasses a Community Market, fan-written game guides, and can even manage MMO subscriptions for you. Now Valve is overhauling its game recommendations with Steam Reviews, a new service that lets the community provide public feedback to customers and developers alike. 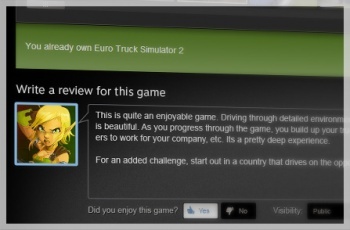 It's important to note that Steam Reviews are different from the Metacritic listings provided on each game page. Steam Reviews don't even offer numerical scores, since such numbers fluctuate long after a game's release, although Valve could implement them in the future. Instead, this service expands on its previous game recommendation service. Reviews can be listed publicly on each game's store page, where the community rates their usefulness. The most recent helpful reviews are moved to the top of the list, giving customers get a community-led crash course on what they should expect from each game. If that's all Steam Reviews were, they'd be no different than Amazon's customer reviews, but there are a few nice touches Valve is testing for its beta. For example, each review lists how much time the reviewer put into the game, reinforcing their positive or negative opinions. Steam Reviews can also be prioritized by language, in case English isn't your native tongue, or if you prefer Italian and Hungarian commentary. Most importantly, developers can read and directly comment on individual reviews, responding to concerns and noting any game updates where appropriate. All previous recommendations have been converted to Steam Reviews, and can made visible to the public at any time. The service should see further changes as the beta continues, but I'm personally interested in how Valve will respond to abusive comments, whether from the community or developers themselves. Given that it didn't take long for Valve to take a stance on Steam Greenlight trolls, we should find out very soon.